← Stop fooling yourself; the Left wants America destroyed – BAN SHARIA! The U.S. Code of Law is clear. Trump has complete authority to institute a ban on whomever he, as President, deems dangerous to Americans even if that includes ALL Moslems! 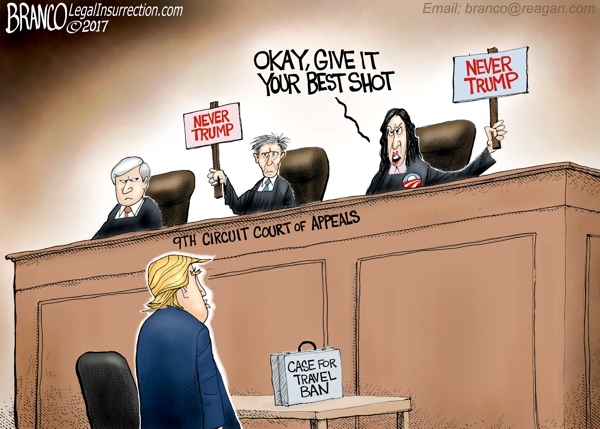 Liberal Activist Leftwing Anarchist judges are not ruling in accordance with the law, but usurping the power of the President. This is a direct violation of the Constitution and their oaths of office. Trump should not be waiting for them to adjudicate his Executive Order restricting travel from terrorist exporting nations. He should have Attorney General Jeff Sessions prosecute these judges and remove them from office. This is indisputable. These lala judges are not abiding by the law, but using their own, personal opinions of Donald Trump the person, whom they loathe for no other reason other than that he is a Christian conservative Republican, to reach their conclusions. They are not upholding the law, they are violating the law. 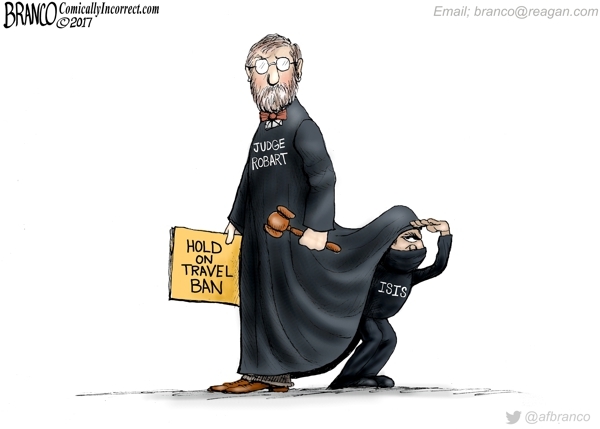 This is not a righteous judiciary, but a traitorous one. All of the judges who have declared Trump’s immigration restrictions against the law are in breach of the Constitution’s separation of powers. They are trying to take away the rights and powers of the President of the United States and take on the mantle of power for themselves. This has always been the Democrat’s plan when the voters reject them and remove them from office – to use the judiciary to sabotage Republican efforts to repair the damage they have done. President Trump is being excessively patient and lenient in permitting this atrocity, this attack on the will of the American people, to continue through the courts. Paid protesters, leftists, and Obama’s Black Flag Army flooded the streets, airports, and universities, often violently rioting the moment this order was signed. It does not matter one whit to any of them that Obama and Clinton exercised this law more stringently. They are not reasonable. They are not righteous. They are not pro-Americans. They are the Nazi Communists who have infiltrated, corrupted, and indoctrinated ignorant people to support their malicious agenda. Liberalism represents as small a minority in America as members of the Nazi and Communist Parties in WWII Germany and Russia. The tyranny they seek to impose must be crushed by every means available. This dispute may go to the Supreme Court, which is currently short one conservative. Democrats are obstructing in the extreme with only half of Trump’s Cabinet seated, and they will obstruct the installment of Gorsuch until after the ruling on this order if they can. If nothing else, it is imperative that Gorsuch be appointed prior and that the Republican Congress use the Democrat’s nuclear option to seat him. That will pave the way to then use that option again in the future when Ginsburg and Breyer vacate their seats. For when that happens the leftwing radical Democrats will wage a supreme war to keep the Supreme Court from becoming a conservative bastion against the malevolence of liberalism and all the petty lala judges they installed in lesser courts. 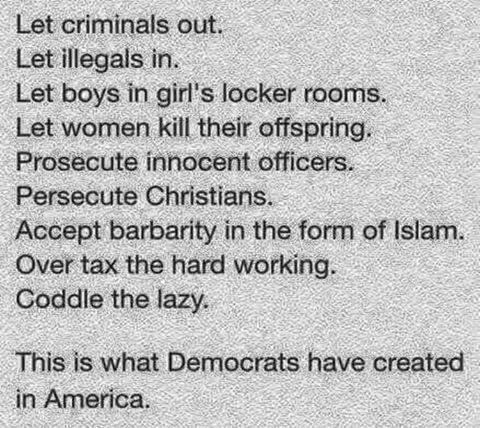 Stop fooling yourself; the Left wants to destroy America! BAN SHARIA! Leftists claim no one from the countries in Trump’s Order has committed any terrorist crimes in America. In the Dallas area alone there have been a dozen murders and numerous other violent crimes by people from these countries; crimes that the Obama government has refused to label Islamic terrorism despite proof. These judges/radical activists are not concerned with the safety and wellbeing of the people, only with denying success to their enemies in order to restore power to their masters. 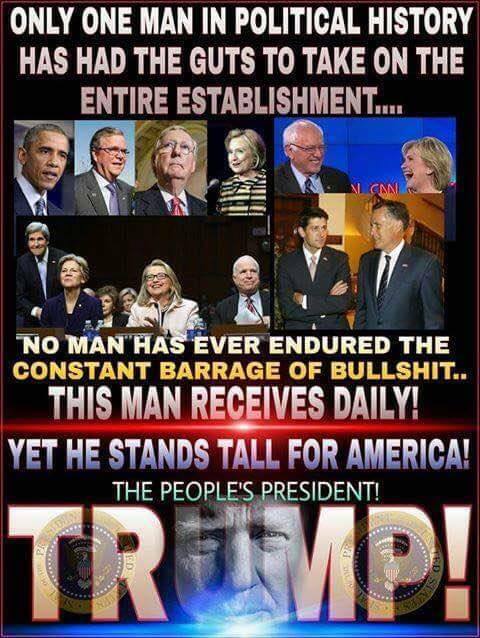 This entry was posted in Congress, Conservatism vs. Liberalism, Illegal Immigration, Islamism, Obama's legacy, Politics, Racism, Religion, Right vs. Left and tagged Activist judges, Congress nuclear option, Democrat obstruction, Donald Trump, Leftist anarchy, Leftwing propaganda, Liberal hate, Muslim ban, Nuclear Option, Repairing America, Supreme Court, Trump's Immigration Order, Will of the People. Bookmark the permalink.